This post has been in my queue for quite some time, but I finally had a few minutes to sit down and finish it. 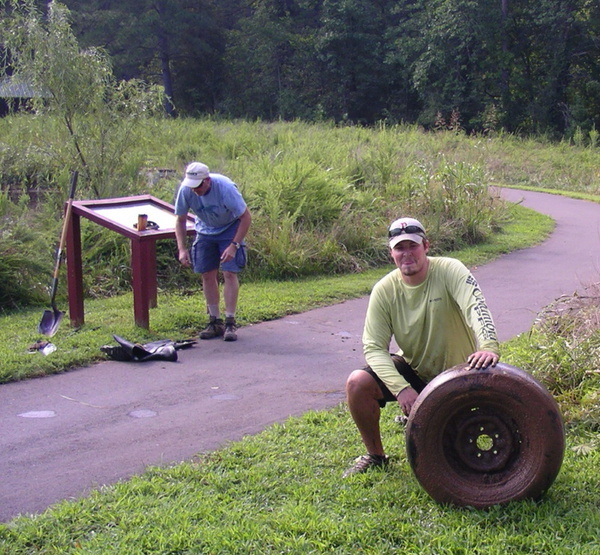 As a kid, I was involved in a number of organizations that did trash pick-ups and other types of conservation work. That continued through my teen years and into college as an Environmental Science student. Since then I strive every time out to make sure that I am a "leave only footprints, take only pictures" outdoorsman. But as I get older I find myself less and less involved with organizations that do conservation work. I tend to lean toward the side of education and personal accountability. Certainly time is a factor these days, but sometimes I wonder if I am doing enough. Earlier this summer, Mary May and I met up with Triangle Fly Fishers to help do a clean-up on the Eno River here in Hillsborough. We removed trash as well as a number of invasive and detrimental species. 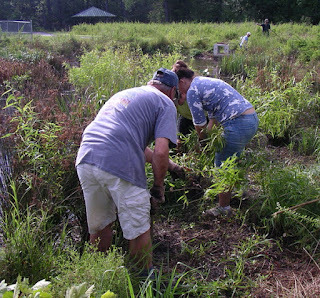 It was fun getting a little dirt under the fingernails and we both felt good at the end of the day knowing that we had accomplished something that would make a difference. But the Eno is a lucky river. It has folks adopting it, it has a conservation association, it has good water quality, and although the watershed is moderately urban, at least through Durham, as a whole it lacks large scale agricultural development. Other bodies of water are not so lucky. On numerous occasions this year I have hauled a hull full of trash back to the launch. It is sad to see folks who have no idea that they "live upstream". So I urge everyone to be conscious of your choices. 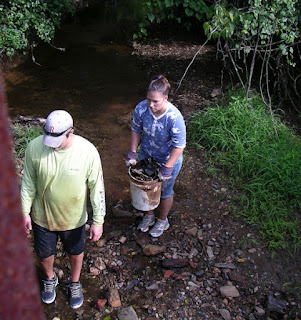 I am not saying to go out and pick up trash every weekend or to go sign up for stream restoration work - just live so that no-one else has to either. Just be wary before your throw that cup out the window or let that old battery fall apart in the back yard. For you ag types, my rants could go on for quite some time, so I will just say this - many local conservation districts will help you with projects that will greatly improve water quality (fences, buffers, etc). Most are free and some even pay you. So pull out the phone book, look-up your local ag office, and give them a call. So why is this flowing out of my fingers all of a sudden? I guess it is because of all the amazing places I have been this year, soon to be capped off with a trip to Texas to fish for one of the most threatened species - the Guadalupe Bass. Pat Kellner did a great blog a while ago about the Guads and how special they are to the region. 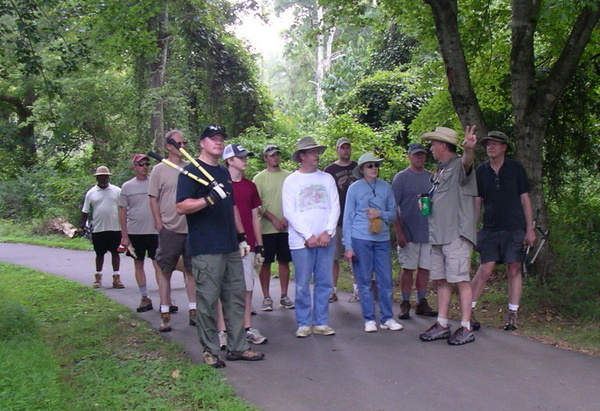 Shoal, Suwannee, and other bass species have similar cult like followings. The bottom line, no matter what species or region, is preserving these species for future generations. That includes practicing catch and release and obeying size and creel limits. And one final thing we can all do is have our state or local wildlife officials phone number in our wallets or phone contacts. I have dialed them here in NC on numerous occasions to report violations when in the field. If you wait until you get home, it will most likely be too late. I have one final thing that I think can help - and it boils down to publicity and marketing. Conservation needs to be viewed as a hotter topic. Groups like GreenFish and Recycled Fish are a step in the right direction, but it needs to go further. It needs to become "cool". For the past two years, my "write-in category" for the Kayak Anglers Choice Awards has been someone who goes above and beyond in terms of the combination of conservation and kayak angling. Both years it didn't make the cut as an extra category, although I hoped they were contacted via email to let them know that their efforts are being recognized. But most of the outdoorsman I know are like me - they would rather be responsible while fishing or hunting. They let the idea of having to pick up after others slip to the back of their mind. It is sad and needs to change in so many ways. But outdoorsman are the group that need to spearhead the change. Drew, I wish I would have thought about that. There needs to be a category for Conservationist of the Year in the Kayak Anglers Choice awards. Anyway, great article. Lets keep pushing to make preservation and conservation cool! Dude, this is so crazy that you wrote this. I have been feeling the exact same way. In fact I contacted NCSU today to find out if anyone is looking to the Hydrilla issue on the river you and I love. It seems the hydrilla is a state wide problem it is being taken seriously. The time table of when things will start being treated is up in the air. That's what I'm concerned about. I wish we could do something now to help this river. There are so many species and factors involved it makes it complicated. Hopefully something will come up soon. A big thanks go out to you and Mary for taking the time to help out with TFF's restoration efforts. It's people taking initiative that will make the difference. It's hard to tell from the other side how many people care until you see the amount of individuals that come out when you have an event like a stream cleanup. Keep putting the word out and I'll try to do the same.